If your goal in getting a facial is just to be pampered, chances are good that you’ll find what you’re looking for. there’s really no downside. People who have had facials often report feeling relaxed after the treatment has finished. 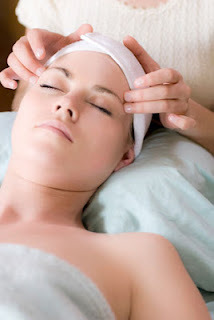 For others, a facial is primarily a way to improve the look of their skin. The body’s natural processes can dull facial skin. Your skin constantly sloughs off dead cells. These cells can clog pores and give the skin an aged look. Daily exposure to the sun and other elements also take a toll on the skin [source: Angier]. Facials are believed by many to fix these common skin problems. Exfoliation, with astringents, masks or peels, can reach deep into the skin’s upper layer to strip away dead skin cells and reveal newer cells underneath. Treatments such as oxygen facials are said to help boost growth of new skin cells and soften the skin to eliminate lines, at least temporarily. Other procedures included in facials use electric microcurrents to stimulate facial muscles and — again, temporarily — give the skin a firmer, tighter look [source: Saint Louis]. Of course, a facial isn’t a magic cure, and you have to be willing to take proper care of yourself to look and feel healthy. Even the world’s greatest facial won’t do much good if you chow down each day on greasy foods and consider channel surfing the ultimate in daily exercise. Still, many people who get facials find benefits. Skin often looks and feels better after a treatment, even if the improvement is temporary. In addition to the potential benefits, a facial, like most other treatments, isn’t without risks. For example, you might have an allergic reaction to some of the products being used or find that they increase breakouts on your skin. There’s also the chance that an accident will occur, such as getting burned by a dripping steamer or getting sick from equipment that wasn’t properly sanitized. You might not be able to avoid all risks, but doing your research and speaking with the spa or salon staff beforehand is always a good idea. You now know what a facial is, and you know what to expect. So how much will the whole thing set you back? That’s up next.